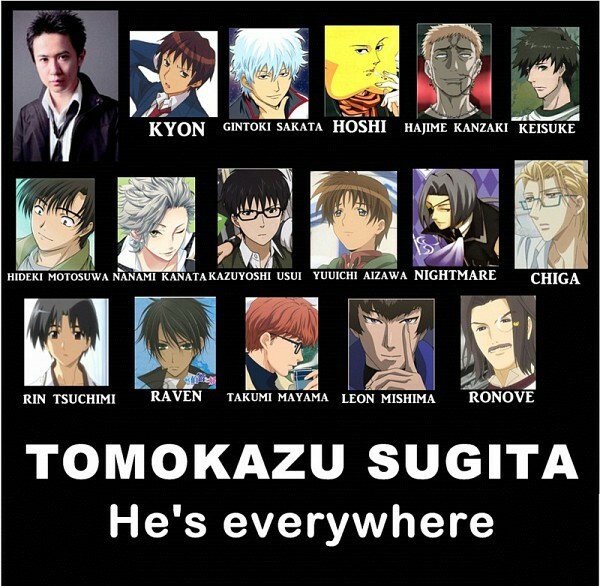 Tomokazu Sugita (杉田 智和 Sugita Tomokazu, born October 11, 1980 in Saitama) is a Japanese voice actor employed by Atomic Monkey. Best known for his role as Gintoki in Gintama, he also voices Kyon in The Melancholy of Haruhi Suzumiya and Ragna the Bloodedge in Blazblue. He is also one of the three hosts on the radio show Bururaji (BlueRadio) promoting the videogame Blazblue which is produced and released on Nico Nico Douga. The other two hosts are Kanako Kondou and Asami Imai, who also voice characters in Blazblue. Sugita and fellow voice actor Narita Ken are sometimes referred to as "brothers" due to a joke made during Live Pastel Collection 2003. During an Omaera No Tame Darou event, hosts Morikawa Toshiyuki and Hiyama Nobuyuki asked Sugita how they were similar. His answer was that both of them rarely blink, making eye-to-eye contact with either a frightening encounter. Sugita has also has a close friendship with fellow voice actor Nakamura Yuichi since 2001. Both play male leads in two anime adapted from Key visual novels, Yuichi Aizawa of Kanon and Tomoya Okazaki of Clannad, respectively. At the 33rd Anime Grand Prix, his voice character Gintoki Sakata won the most favorite male character which means Sugita's character roles consecutively won the most favorite male character in 2009 and 2010 Anime Grand Prix. Uniquely, those characters are from different anime: Kyon from The Melancholy of Haruhi Suzumiya (2009) and Gintoki Sakata from Gintama (2010). Sugita and Nakamura also work together in the Blazblue series as the protagonist Ragna and antagonist Hazama respectively. In 2010 he was part of a live-action film, Wonderful World, along with fellow voice actors, Mamoru Miyano, Tomokazu Seki, Rikiya Koyama, Yuka Hirata, Showtaro Morikubo and Daisuke Namikawa. Sugita won for "Best Supporting Actor" in the Third Seiyu Awards.